Jag har en signal som kommer från en videospelare som använder Firewire 1394. Min nya dator saknar just den kontakten. Jag letar efter konvertering till USB3. Jag använder Edius Pro 8.5 som klarar det mesta. Vet någon hur man gör? 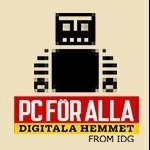 Den enkla lösningen är: Byt videospelare som kan skicka videoström med en mer modern kontakt, Display Port eller HDMI. Where can I get USB 3.0 to Firewire 400 converter? You're not seeing such a converter for several marketing reasons, aside from any technical hurdles. Demand for such a converter is strong, but it comes from a tiny niche group of users so small that developing such a thing isn't cost effective (if it was, commodity Windows laptops would still have IEE1394 ports or include Thunderbolt). Most of the people who still need FireWire 400 connectivity need it for legacy devices that are either too expensive to give up (medium format digital photography backs) or irreplaceable (Nikon/Imacon film scanners, Creo flatbeds, etc). Those people have long since resigned themselves to either using a separate, older Windows/Mac computer to run those items, or migrating to a current Mac with "Thunderbolt" port that is (clumsily) convertible to FireWire with a dongle accessory. Makers of that converter would be dealing with a lot of other variables. The problem isn't just the hardware: many legacy FireWire devices run on proprietary software that expects a certain type of FireWire controller chip, driver or OS interface. That software in many cases hasn't been updated in ten years, so wouldn't necessarily be compatible with Windows 8, 10 or current versions of MacOS patched thru an oddball adapter. That would create a support nightmare for developers of any FireWire>USB converter, akin to what happened with the old USB>SCSI converters (which were a disaster). Det där är inte helt enkelt. Är det en stationär dator är det bästa att skaffa ett FireWire-kort som sätts i en PCI-expressplats. Finns det sådana kort så vore det nog det enklaste. Det finns ju massor av utrustning som t ex kameror av olika slag som bara har den utgången. Mina två video kameror och en videospelare har dessa kontakter. Tack för synpunkterna i bifogad text och svaren!